PRESS RELEASE: Leader of the LMP party in Hungary, Mr. András Schiffer, demands an inquiry into the treatment of pro-Tibetan protestors during the visit of Chinese Prime Miniter Wen Jiabao in Budapest last June. The LMP party in Hungary (Lehet Más a Politika, or Politics Can Be Different) is expecting a prosecutor’s inquiry in connection with the actions against the Tibetans during the visit of the Chinese Prime Minister Wen Jiaobao in Budapest at the end of June. The leader of the LMP party fraction Mr. András Schiffer declared that the ombudsman of civil rights acknowledged the previous standpoint of the party and established the encroachment on the rights of Tibetan demonstrators in the case of the act of the police as well as that of the Office of Immigration. In the beginning of July, Mr. Schiffer has already criticized things in the Hungarian Parliament, namely that the policemen insulted the Tibet activists who wanted to demonstrate, that the police has forbidden a Tibet demonstration and the fact that all the Tibetan refugees were required to report to the Immigration Office for no reason the day of the visit of Wen Jiaobao, to prevent them from demonstrating. He also added that according to the police, the demonstration was banned because of potential traffic problems due to the protests, and to guarantee the security and a smooth transport of the Chinese delegation. Later however, the Prime Minister Mr. Viktor Orbán referred in the Hungarian Parliament to the interests of Hungary’s foreign policy as the reason for cancelling the demonstration. Mr. András Schiffer considered this last reasoning as completely illegal and observed that a week later, while Under-Secretary of State Mr. Károly Kontrát replied to his interpellation reading the same pretences in a pretty shame-blushing way, it [became] clear that the banning of the demonstration had been realized without any legal tool. 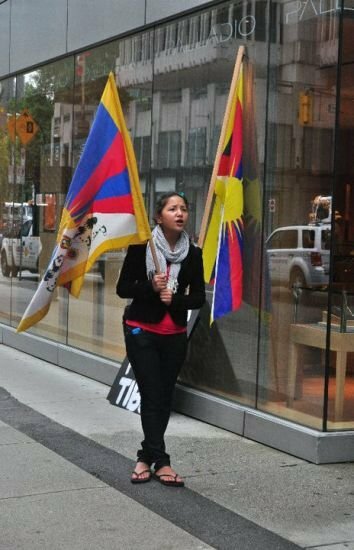 According to the LMP fraction’s leader, the police and the Immigration Office have treated the Tibet activists in the same way as during the Medgyessy and Gyurcsány governments when they acted against all the demonstrations they disliked. In his opinion, the Fidesz party of Prime Minister Orbán does exactly the same now as those previous socialist governments, although the Fidesz party has criticized them a lot too in the past in connection with demonstrations. Mr. Schiffer stated that there is a very clear law in Hungary about public protests, but in the practical application, the abuse of this law by political power can be continuously observed. The ombudsman published his report of inquiry, which reminds that on 24th and 25th July, before and during the visit of the Chinese Prime Minister in Budapest, the policy acted against persons who were expressing their own opinion with Tibet flags and criticizing the policy of the People's Republic of China.